As a digitally active business in 2017, you can’t afford to lose your data. Whether due to natural disaster, human error, or security breach, data loss is not only very costly but extremely risky. That’s why every Small and Midsize Businesses (SMB) needs a business continuity and disaster recovery solution. Research from Security Week suggests the total volume of data loss at the SMB level has multiplied more than 400 percent over the last couple of years and the trend doesn’t look it will slow down any time soon. The growing trend of cloud computing and mobile devices within workplaces has made network security and data protection increasingly more difficult. Research shows that the overall loss of information breaches will escalate to more than $2.1 trillion by 2019. A major concern is the fact that small and medium businesses don’t take data protection seriously. They incorrectly think that it’s the large enterprises that face the highest risks. Unfortunately, this is a hugely false assumption with small data breaches costing as much as $35,730 US dollars per incident. Well, the most basic definition is a combination of backup and disaster recovery solutions and procedures that are designed to work collectively to ensure overall availability and reduce the risk of data loss during catastrophic failure or other compromising scenarios. To put it simply, BCDR solutions preserve your business and keeps data safe when any disaster strikes. Why does my business require a BCDR solution? Protects against major disasters. Whether it’s a flood, earthquake, typhoon, snowstorm, or any natural disasters, any one of them can severely disrupt your business for extended periods. According to the U.S. National Archives and Records Administration, more than 90 percent of businesses that suffer 7 days or more of data loss and/or downtime go out of business within a year. Let that sink in for a moment. A BCDR solution won’t prevent a natural disaster, but BCDR will protect your data and ensure that downtime doesn’t damage your business. Minimize impact of cyber attacks. Cyber criminals are increasing their efforts and focusing on more on easy targets; organizations that they consider unprotected. Unfortunately, this means small and midsize businesses are the most vulnerable. A BCDR solution will limit the impact of a cyber attack and can save you and your business from losing business-critical data. Keeps customer data secure. Do you store private customer or client information on your network? If so, you can’t afford to lose those records (i.e. financial, medical, etc.) or let them slip into the wrong hands. A BCDR solution guarantees that every one of those records is properly stored and controlled. People are error prone. While natural disasters and cyber attacks make headline news, the fact is your very own employees responsible cause the biggest data losses. Mistakes happen and a single error could result in a security breach and/or significant data loss. That’s why it’s important for businesses to educate their employees properly on data security, but also make an investment in a BCDR solution for when mistakes happen. Systems do fail. Lastly, we all know that computer hardware components fail. Regardless of the amount of investment made in your technology, none of it is perfect nor lasts forever. Even systems that come with 99% uptime promise, will occasionally falter. Therefore, businesses require an effective BCDR solution that ensure quick recovery on hardware replacements. What should business look for in a BCDR solution? Hardware compatibility. Depending on the technology hardware used in your business, you’ll want a BCDR solution that supports your current hardware configuration. Keep this in mind when you evaluate options. Scalable pricing. As your business grows over the years, you’re going to accumulate and store more and more information. A flexible pricing model will provide cost-effective options to adjust with your needs. 24/7 technical support. You can’t predict when disaster will strike. Make sure that your BCDR service provider or MSP has 24/7/365 technical support available. Excellent Reputation. Finally, it’s important to remember the BCDR solutions’ reputation. How long has it been on the market? What do clients say? Your MSP will help you answers these revealing questions. An effective BCDR solution should meet the above standards to be considered the proper solution for your business. Nobody wants anything bad to happen to their business – and with any luck you won’t have to deal with any of the risks highlighted in this article – but the reality is that you’ll likely face one or more of these threats some time in the future. There’s no way to prevent a cyber attack, natural disaster, hardware malfunction, or human blunder, however you can guard your business from expensive data loss by means of investing in a solution that ensures secure data backup and disaster recovery. Quite frankly, it’s unwise to wait a minute longer without a BCDR solution. In a recent event with a high-profile client, we were called afterhours to assess and determine the cause of why our system kept going down which is typically uncommon. After several hours of the client trying to find the root cause of the problem, we contacted our MSP partner NUMENTIS who was able to provide remote troubleshooting within minutes and helped stitch together a solution until they were able to attend in person the following day. NUMENTIS provided our client a very thorough, reasonable, straightforward solution with onsite and remote support which helped resolve the client's issues. Our client was very impressed and as a result we found a solution to a problem that could have only been resolved with willingness, dedication and experience, thanks to NUMENTIS. 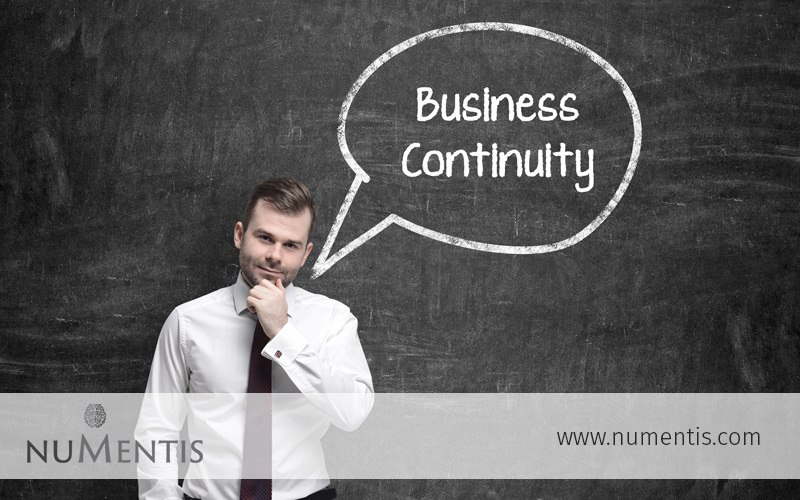 The team at NUMENTIS have helped us modernize, protect and optimize our IT systems. Their ongoing technical support has freed up my time allowing me to focus on our business instead of day to day IT issues. I would recommend NUMENTIS to anyone looking to improve their IT at a controlled cost. Chief Financial Officer at Dymaxium Inc. Artificial intelligence: the good, the bad, and the ugly. NUMENTIS is an Information Technology (I.T.) managed services provider (MSP) and consulting firm that specializes in the architecture, implementation, security, and support of I.T. infrastructure and cloud services. © 2019 NUMENTIS All Rights Reserved.